see you in wordcamp 2009! 😀 yay! Haha, well you really were looking for somebody. You didn’t look like idiots. You just looked like people who were looking for someone. Your excuse letter is made of win. And it was nice meeting you! Hope we can jumpstart Web Standards Philippines ASAP! It’s great that Filipinos are doing well in this. Mabuhay ang pinoy! 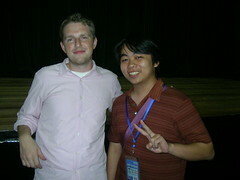 Buti ka pa nakaattend at nakapagpapicture with Matt Mullenweg. Kung malapit lang sana SF dito samin nakaattend na rin sana ako ng WordCamp, kaso 8 hour drive din yon.